SABATON's Par Sundström comments, "We are excited to return to American grounds after the last successful tour. 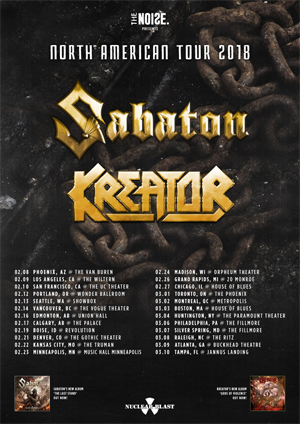 Teaming up with our friends in KREATOR, we are able to play larger venues which allows us to bring a bigger production than we ever brought into America." SABATON will be touring in support of their eighth album, The Last Stand. Check out the the lyric video for "Sparta" which chronicles the story of the most iconic last stands battle of Thermopylae. Listen to it HERE. KREATOR is touring in support of Gods Of Violence which entered the world charts at #16. Citi® Cardmember will have the opportunity to purchase advance tickets from Tuesday, October 31, 2017 at 10:00 AM local time until Thursday, November 2, 2017 at 10:00 PM local time.